First Runner Beans of the year…. Yes, the planting is starting to deliver! Great excitement this week with my two best friends visiting, with lots of talking, laughing eating and drinking going on. The vegetable patch gave us its first little crop of runner beans this week, and a second picking a few days later. Big Man, despite being the largest of the family group this week, was given the honour of squeezing in between the bean canes and picking those precious runners, making sure not to knock any of the delicate flowers (or future beans) off. When I was last in the UK I bought a little gadget for cutting runner beans. You snip the ends off with a little blade then run them through a hole with several blades. Result? Long thin strings of spaghetti like bean strips. This means you can cook them quickly and still retain colour and flavour. I won´t say it´s quicker than doing it the old fashioned way with a sharp knife, but you can see how pretty they look with this simple bowl of boiled beans lurking behind some barbecued hake with alioli. 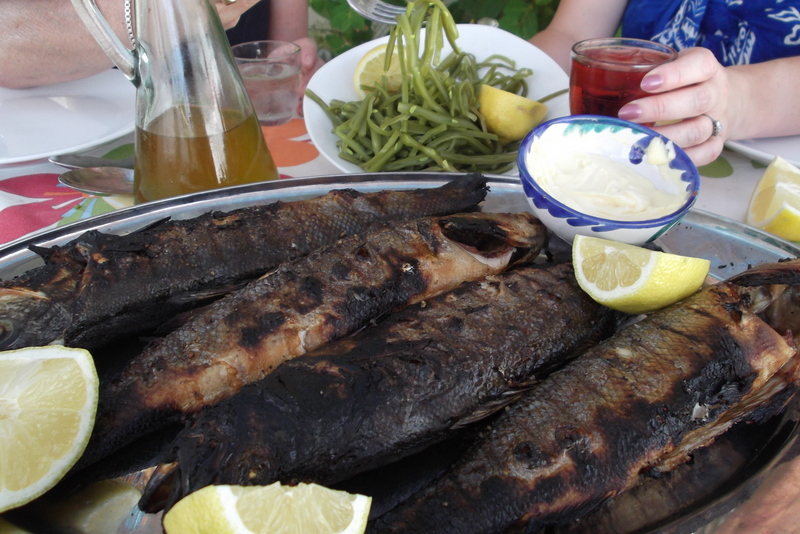 We served them just warm with olive oil and lemon juice. 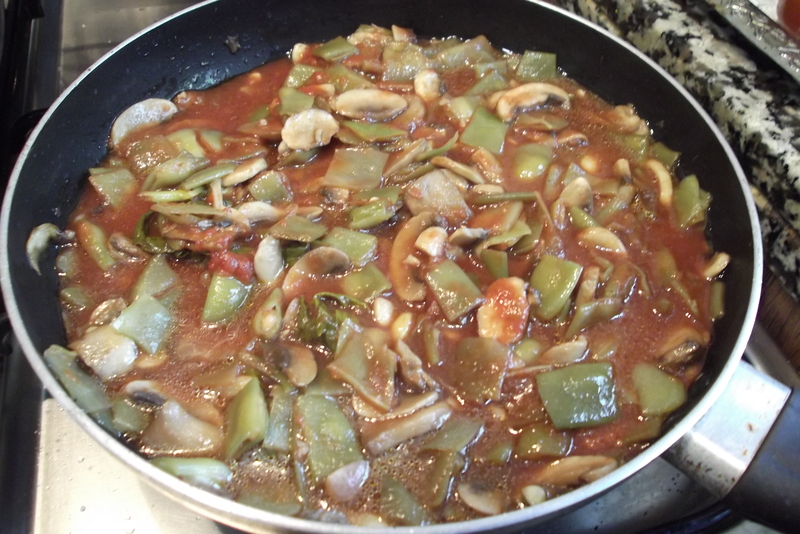 Inspired by a delicious recipe over at Fati´s Recipes, I also cooked some up later in the week with mushrooms and a simple tomato sauce. I lightly fried some sliced mushrooms. 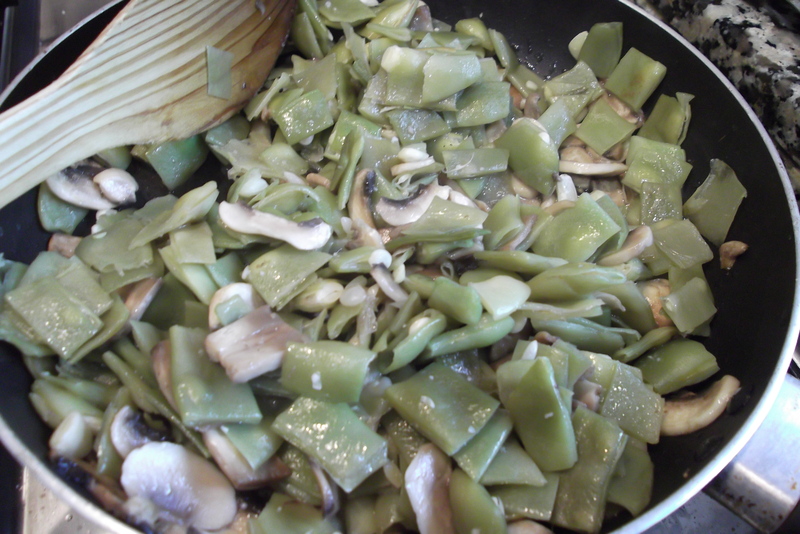 Then I added some blanched beans (which I had chopped into little squares this time). Finally I poured over some home made tomato sauce, a little water, seasoning and simmered until ready. Well, it´s a tough life here…..! 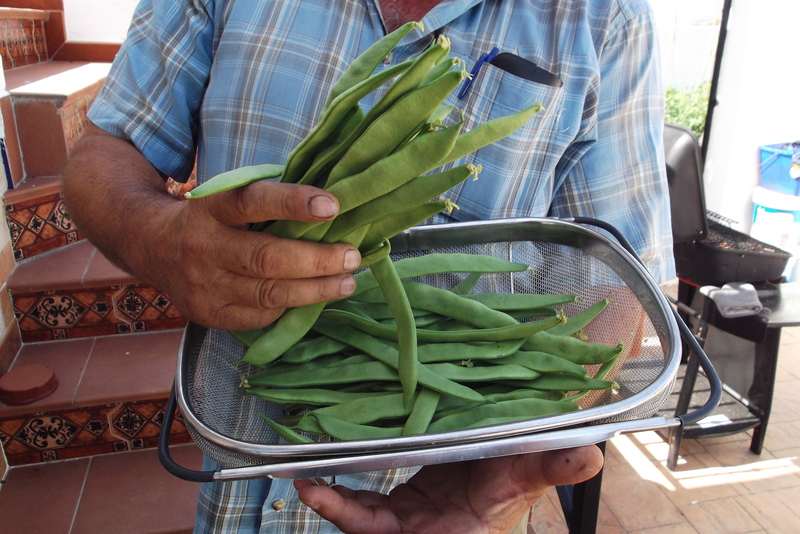 Your runner beans will probably we ready for picking when you´re back. Do hope the trip goes well, just enjoy your time there and we´ll “see” you again when you´re back. Good point about the cutter – the beans need to be super fresh, thinnish and crunchy! My mouth is watering already…..Those vegetables look wonderful!!! Simple and delicious – we are already getting to the point where we will need to start freezing them! Oooooooo, thank you chicaandaluza 🙂 I am over the moon to see your inspiration’s version 😀 It really looks great…!! This morning I pick the first runner beans too – mine are white. In Greece, their are cooked in tomato sauce with onions,some potatoes, carrots, parsley and a lot of olive oil . What a neat little gadget! I so wish I had could grow a garden; no space where I live, so herbs are my garden! The whole fish looks amazing! I really like your style of cooking. And, btw, behind Big Man, I noticed those steps… I love that look! Seems my steps up to the roof terrace are a big hit 🙂 Just told Big Man and he´s happy as they were the only tiles he was “allowed” to choose alone! And the gadget is great, wonder how long it will last until I break it?! That does look amazing. I noticed the grill even in the first picture. So sad of me. Am, as always, in awe of your garden. Love that people are noticing my grill and tiles! I know a gas bbq is not quite the same as a charcoal one, but for convenience it´s great….it´s like my summer kitchen! You peek away, I don´t mind! It´s funny becuase all our Spanish friends and family think the house has a slightly “English or non Spanish” feel to it, and the English all think it is very “Spanish”. I guess this means we´ve managed to blend it all well with touches from both our cultures. We spend a lot of time outside, and the sun room where I took the photo of the dress is great when the weather is not great as we feel like we´re outside while we´re protected from the elements! Oh my! you and Greg make me wish for a garden..you know maybe I should nag for a garden instead of wish for one..
nag till my husband sells the house and buys one with a garden..think it will work? Oh dear, don´t want to be the cause of a divorce over a garden 😉 But be are lucky, and lucky too that we both enjoy working on it….and eating everything!! Runner beans are delicious, I love hake too. Can’t get it very often in the UK. But it’s a taste that lingers from my childhood. Now that I think about it, i don´t recall ever eating much hake in the UK either. It has such a lovely taste, but is quite robust and stands up to a good barbecue! Thanks for your visit to my blog! They look delicious! Are they Spanish climbing beans – they look flatter than British runner beans and more like what are called Coco Plat here. They’re less stringy than runner beans. Olive oil and lemon juice, and perhaps a little garlic, is all they need! 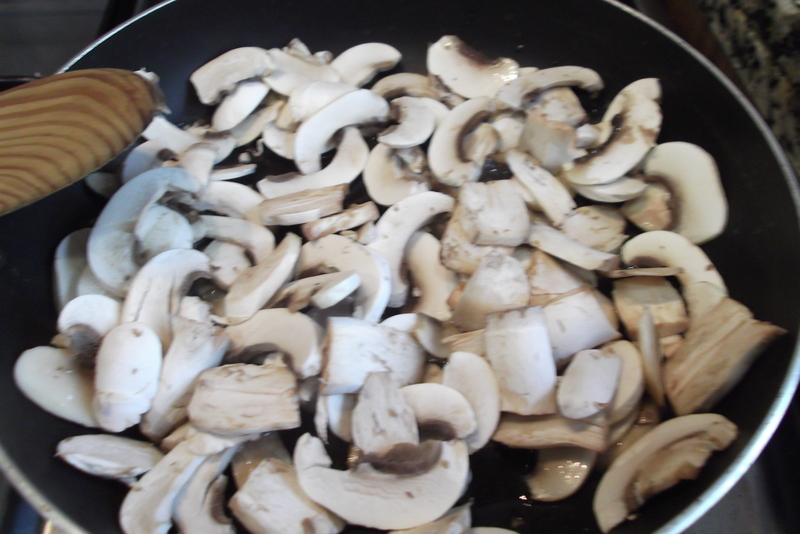 Although your recipe with the mushrooms looks good too. I´m not sure exactly what they are – they are called judias and look like runner beans (well the plants do) but they have white flowers and not red lik the British ones. They get more “lumpy” if you leave them another day or so. Forgot the garlic – to be honest, as you say with lemon, oil and garlic is the best. Keep it simple! I love shredded runners like that – the perfect veg to go with almost any summer meal. One of the ladies in the village has got a particularly amazing recipe for runner bean chutney. I must get it off her and post it up for all to enjoy! 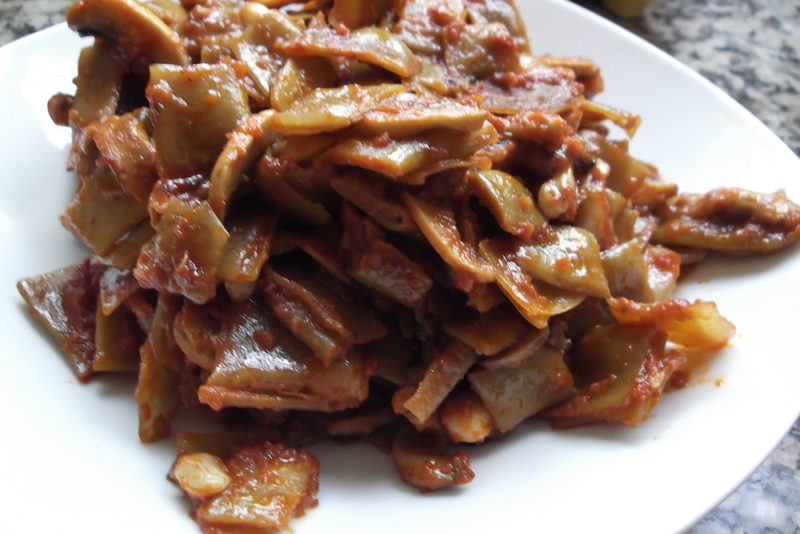 Oooh – runner bean chutney. Perfect for that end of summer glut! Look forward to reading your recipe (although couldn´t connect to your blog this morning). Oh no… our internet has been down for two days. Maybe it’s that. If not, will have to do some technical investigating!